My Journal Practice is Messy, Un-Instagramable, & Effective. Here’s Why. I’ve always admired Instagrammed pictures of work-of-art journals. Consciously curated lists and doodles and handwritten personal fonts are inspiring to look at and no doubt, functional for those who keep them. 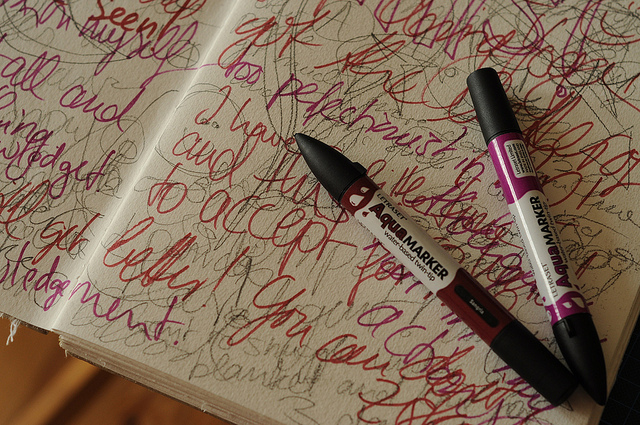 But my own journal is, and has always been, scrawly, sprawling, inarticulate and very messy. To me, there’s just no other way to do it—being messy is the reason it works. Release the past and move on. Moving the clutter of old, stagnant thoughts out of my head and into my journal leaves me free to move on to new creative possibilities. 2. Get honest with myself. If I want to accept myself, I can’t censor myself. Writing down all my thoughts faster than my inner critic gets a chance to slow me down and make me self-concious gives me the chance to actually process my actual thoughts. I have a chance to write everything down and look rationally at the irrational. Sometimes, it takes a lot of writing to get down to the honest truth at the bottom of the confusion, but free-writing is an effective way to get there. Once I arrive at the honest truth behind a feeling or something I’m experiencing, I’m able to accept it. Journalling has a way of bringing us face-to-face with our truth. We realize what’s on our mind, even if we’re not fully aware of it. Only when we lay our thoughts out in front of us can we see our situation for what it is. We get to understand why we’re reacting how we are, and in the very act of journalling, whatever is happening to us becomes what is happening for us. Lessons become evident and our tasks becomes clear. Genuine gratitude is often hard-learned – but it beats forced gratitude lists. 4. Go deep, dream big. Unlike a vision board, which pulls together images from sources, all outside of me, my journal is a place where my own psyche is the only source from which I can pull. The visions I create here are mine and mine alone. There’s a lot of fodder there, though, and an environment of allowance (or messiness) is fertile ground for creativity. Should, can’t, impossible don’t come to these pages—and when they do they’re quick to be found out and unmasked for what they are – fear. Journaling un-selfconsciously can cause a chain reaction of new ideas. This is the mental momentum we need to add some grease around mental blocks, ruts, or situations we can’t seem to find a way out of. We might not be aware of a solution to try to think of one, but when we write down one known idea and allow it to lead to the next, we help ourselves get there. We can try out new possibilities and concepts in journalling. Allowing that to be a messy process takes the pressure off—only then we can arrive at new, creative solutions. Life is messy and for me, writing my way through the mess is the best way to stay happy and clear. This is the purpose of my journal. My journal isn’t pretty, and I’m so, so grateful for it—it’s a mess so I don’t have to be. 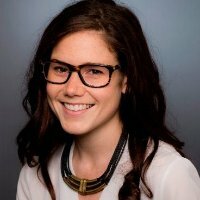 Kait Fowlie is Toronto-based writer, editor, digital marketer and collector of wellness wisdom for creative types.